This is the art of theatre pared down to its bones. At a time when theatre was getting lost in artifice, technical extravaganza, and commercialism it came as a welcome antidote. The book to which this is the beginning was called the Empty Space. I can take any empty space and call it a bare classroom. A woman talks in this empty space whilst someone else is listening to her, and this is all that is needed for an act of schooling to be engaged. Strip away everything. No computers and clocks; no pens, blue, black, red or green. No books. No chair or table. Just two people. But when finished with, de-clutter, and return to the bare classroom… the empty space, for it is in this space that you will both begin to understand how to teach and how to learn. If only it were true, alas it is not. However the example illustrates very well some of the complex issues in teaching. You rightly identify one or two of the common features of the two concepts that comprise your analogy. Peter Blake is clearly an expert in his field and I wouldn’t even presume to disagree with him. He describes the minimum necessary conditions for an act of theatre to take place. 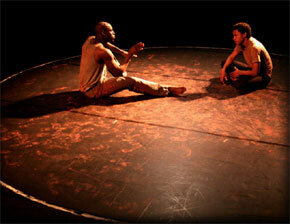 A piece of theatre can be interactive and the larger the adience the more difficult two way communication becomes. More often the audience just sit and watch and sit and listen. They interpret the performance for themselves. As you suggest, a space a teacher and a student is all that is needed for teaching to take place. This however this is the minimum necessary condition for teaching to take place and says nothing about learning. To the traditionalist this may be heaven but for the progressive, who is looking for evidence of construction/assimilation of knowledge we need some two way communication if the teacher is to be sure that learning has taken place. In the theatre some feedback would be necessary to ensure that the audience had understood the messages intended by the actor. As the class grows in size so the tendency to “engage in an act of theatre” increases at the possible expense of learning. I believe it was Hargreaves (way back) among others who included “actor” as one of the roles adopted by the classroom teacher. If both processes are two way and one to one then the two contexts are very similar. If only teaching were this way. For me the reasons why some individuals think they are so good at acting that the message must get across while others think that their acting skills need to be checked as the audience will construct their own meaning from the performance are the most fascinating aspect of teaching/learning. So yes, if you reduce the thing to two people then the process you describe can produce learning from teaching. The extent to which this process is scalable is for me questionable. Is it possible that those who see themselves as extraordinary actors/performers need to have enormous confidence in their own acting at the same time as downplaying the differences between students and the extent to which individuals construct their own knowledge. Maybe “teacher talkers” see their actor role as supreme and with assumptions that reduce the proces to a teacher, a student and a space are essential to their performance. For progressives, the student is the “star”, not the teacher. I think the idea that the pupils are not the stars in a traditional classroom is a bit offensive. Also given that it is progressivism that has led to the ‘dancing monkey’ approach to lessons, it seems they have done their fair share to promote the ‘teacher as star’. I did this–I taught an ESL class in Haiti for several summers–no electricity, no copies, no textbooks for the students. I had an ancient blackboard, incredibly poor quality chalk and 50 students jammed into a classroom. We had to chase a bat out one morning. But….learning happened. I lectured, we did pair and group work, then I read to them and let them ask me questions. They loved it and begged me to stay longer, but alas, my school was starting its new year where we were instituting a 1:1 program because “learning styles” and “21st Century Skills”. I think maybe we should focus more on the basics and 19th century skills instead…. I agree with the article. The essence of good teaching and learning is effective communication between both parties, and however much dTeach attempts to opine otherwise, their rhetoric actually supports the original thesis. Yes, of course teaching can be a complex process, and those complexities are brought into the classroom space from outside. I am neither traditionalist nor progressive, but do understand the nature of the skills and processes of our profession. Sometimes it is valuable to reflect on what is really at the centre when all the fads, fashions and (dare I say it) ‘learning technologies’ gave been stripped away. Sorry Martin, but strip it down to two people and you don’t have a classroom, but a nice, cosy middle-class tuition scenario. Education, yes, an act of schooling, more questionably? Part of the magic of theatre is the audience, the magic of the classroom, the class. Exactly – this is Socrates, an Oxbridge tutorial, what one 19th C American president described as his ideal learning environment: “a log hut, with only a simple bench, Mark Hopkins on one end and I on the other”. But it doesn’t handle scale, which is the key problem facing modern education and the reason why what Brian Simon called “pedagogical romanticism” is not enough. I think some of the criticisms here miss the point of this. The one-to-one set-up for example is not something that normally exists in the theatre in practice, but in a good moment it *feels* intimate – as if the actors were communicating directly with you. I also don’t see this as a prescription for how all classrooms should ideally be. Rather I see it as a treatise for what should be at the core of the classroom – the relationship between the teacher and the pupil, where the relationship that the teacher has with their subject – their passion, their fascination, their personal insight – is shared, communicated, transmitted inter-personally…humanly. Sure, trying to teach everything this way isn’t possible or necessary given the intensity and resources of a modern curriculum, but it should ideally provide a core mode of being, where – from time to time – things can be stripped-back, and reset be pressed. I have thought this before, but I really would like to have a special day of teaching like this in our school (we are KS2) – where, perhaps in a carousel throughout the day, teachers are free to teach anything that they feel passionate about to each of the classes, using only direct communication and physical totems.